In the mid 1990’s Shanghai was home to 80% of the world’s cranes. In the late 1990’s many of the high-rise office and apartment blocks that they built stood empty. Now, however, they are full, and this guy on the bike proves it. He’s one of hundreds in the city delivering indoor plants to decorate once empty lobbies, homes and offices. 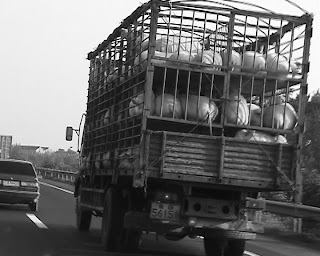 The Crash Test Dummy has been traveling this week so this post comes from a car on the Nanjing Expressway.Pork is the main meat in Chinese food and ifyou ever wondered how it gets to the kitchen, here’s your answer. Unfortunately, as it all ends up chopped into wok-size pieces, we have all this pork traveling around the country but you still can’t get a decent bacon sandwich here for love nor money. Coming down off this Suzhou Creek bridge is the only free-wheeling section of my ride. With the mess of traffic at the bottom it’s best to hold back a bit – even more so if you’re carrying a heavy load balanced on the back of your bike. Sixty full bottles of beer, for example. 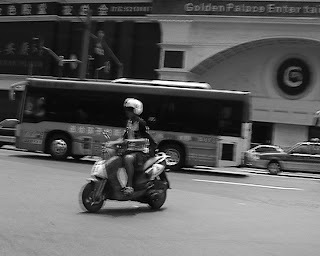 As with the Traffic assistants, Shanghai’s police do as good as they can under the circumstances. 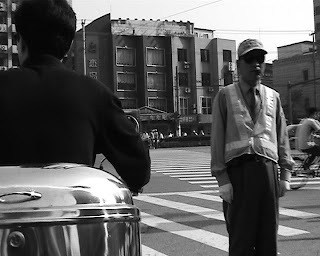 Here’s a typical dilemma: our passing cop spots a moped vegetable delivery guy, two cyclists and the jaywalker in the white dress all crossing illegally. He can’t nab them all so he chooses the girl because she’s ignored both a pedestrian crossing AND a footbridge to walk straight across this busy junction. Of course, trying to brush him off doesn’t do her any favours at all! Continuing our series of alternative head-gear, we present a cool dude in a Chinese fighter pilot’s helmet. We have to admit, The Crash Test Dummy has seen these for sale and has been tempted to get one. We’re just not sure how cool it would look on a mountain bike – and we don’t want Wingman to get jealous. 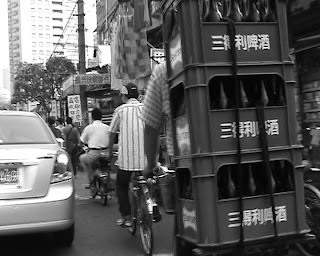 Shanghai’s traffic guys do as good a job as they can under the circumstances. They’re fighting against a traffic system that gives a green light to both vehicles and pedestrians at the same time and a driving public that thinks the rules don’t apply to them. Mind you, we’ll all be happier once they look at the road before waving you out. I have seen them happily usher bikes and pedestrians into the path of oncoming buses that have jumped the lights – more than once. Entrepreneurism in action! Spot the lady wearing a snazzy velvet maroon riding hat (on the red moped). This is a common sight in Shanghai where (I presume) a Chinese manufacturer of riding hats for export has created a local market for the same product. They’re popular with both men and women and this lady sports the maroon model with a visor. Ironically, in Chinese, the expression “I’m on my way” translates more literally as “I’m coming on horseback” (wo ma shang lai).